We’re going ever deeper into the ICO space here at The Mission and it’s child publication, Humanizing Tech. What started 6 months ago on The Base Code Fund’s investment into Ethereum as well as various conversations with a few knowledgeable players in the industry, from hedge funds to new ICO practitioners to even some folks building a new exchange, it’s always been our goal to open-source the knowledge and tools that we use. Today we continue that tradition with a simple, new tool for you to gain at least a little bit of knowledge from. After doing a number of Google searches and research over the last month, we had yet to come across a simple market map that lists out how many ICOs are in each specific industry vertical. For example, 17 in the finance space, 10 in the protocol layer, 2 in file storage, 3 in crowdfunding, etc. The goal is to get a sense for what areas are being overpopulated with ICOs and which areas haven’t been touched yet (a lot). It seems almost like there are parallels between the early internet where you’d have a listicle of hundreds of websites until it got to be too much and search was invented. And then, of course Google + ads = mountains of cash. So, we started looking at various lists and figured we’d get started with the Smith + Crown, since they are viewed widely as reputable and have already done some curation of their own. We extracted their list into Excel and started running an analysis on it, which is what follows. Note: please update me in the comments if you have better data you can cite on any of this. Here’s my ICO List Excel File should you want to continue the analysis. From the data set we extracted there were a total of 200 recent ICOs (i.e., 2017-ish), both currently offering tokens and ones that had closed. I have a feeling Smith + Crown removed the scams and BS ICOs, which is why we don’t see a list of 800 total coins that I’ve read are currently being traded. 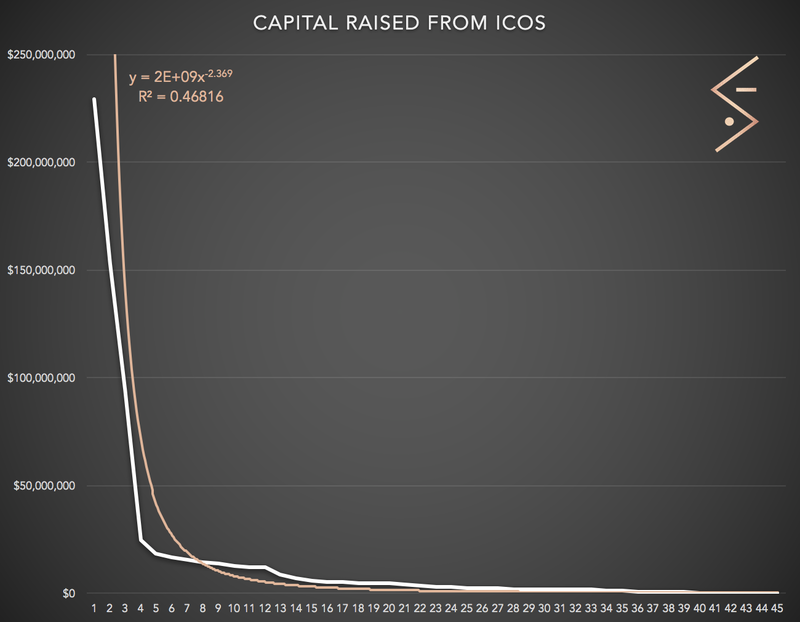 Out of these 200 ICOs, only 42 have raised anything meaningful (more than $200K). That means your probability of success if you do everything right technically, market yourself using a standard approach and have a decent team, is 1 in 5. That’s a 20% success rate. To put this into perspective, a meaningful VC-backed Seed round, on average, is about $1M from PitchBook data. But the success rate, I can tell you from experience, takes much, much longer, requires much more tech and customer traction, and is far, far harder. So, I’ll take a 1 in 5 probability of funding success any day of the week with far less up front work. If you look at that graph of successful fundings above (in white), you’ll notice that it’s pretty much a straight line of revenue from $0 to $25M unless you are one of the Big 3 who raised approximately $230M, $150M, and $100M. So that curve is what you often hear in the startup and VC industry. Everything follows a Power Law curve. That’s the picture above. A few massive winners, and then a bunch of smaller players. For example, the bottom 42 companies raised $225M in total. That’s the same that the #1 company raised. Crazy, right? It’s also the same if you add #2 and #3 together. Again, about $250M. So, the #1 company raised about $250M. The #2 and #3 companies together raised about $250M. And the rest of the group (#4 through #45) raised about $250M. Then everyone else raises zero. So if you raise some type of money, you have a 3 in 45 (or 1 in 15) chance of hitting a home run or grand slam. Call it 5% probability. Still not bad compared to the standard startup / VC funding game. That’s because of human behavior. We’re lemmings. Like 5-year olds playing soccer, everyone is running around chasing the same ball. It’s the same thing playing out in public company stocks. The top 5 tech companies together have a $3 trillion market value (Apple, Amazon, Facebook, Microsoft, Alphabet). Took them decades to get there, but they did it. 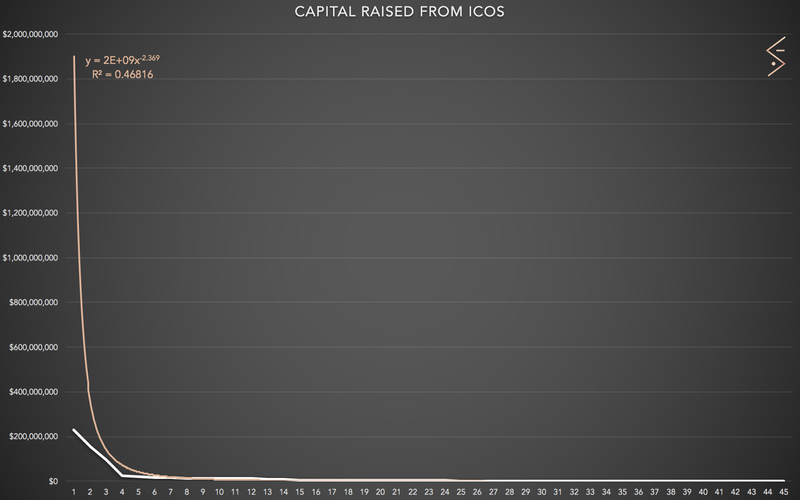 Compare that to less than $1B market value for these recent ICOs. The Equation. So now to the fun part, if you’re interested in STEM. The power-law regression line that predicts the amount you’re going to raise on this curve. x^-2.369 is where you input where you think you are going to fall along that 1 through 45 company line. So enter a number, 1 or 2 or 3 etc. That part is up to you based on your confidence of an ICO. Which means we haven’t seen nothin’ yet for that white line of reality. But it also means that it’s only going to be 1 company who does it. And that means it’s likely going to be a full stack coin, from protocol layer (think HTTP on the web), through transmission layer (think URLs on the web), to enterprise enablement layer (think Facebook’s platform for business ads) to consumer layer (think Snapchat itself). A tool, raised to the power of a tool, raised to the power of a tool, raised to the power of a tool. Don’t forget, Ethereum started life as an ICO but it’s also the underlying technology enabling all these other ICOs. Like the backbone of the internet itself that you can invest in directly. It’s ICO was only $18M if memory serves, but its current market cap is $20B. That’s in only 3 years. To put that liquid valuation into perspective, AirBnB (the 2nd most highly funded startup of all time behind Uber) is currently only valued at about $30B after a decade. So an ICO is growing 3x faster than one of the best startups to ever do it for some really technical protocoly something or other that very few understand compared to freaking hotels. We’re not just in the first inning, we’re still in the first at bat. The next step in any type of analysis like this is to start to identify the types of projects that are successful and compare them to the types that are not. In doing some, we can begin to develop a gut feel for what has a higher probability of success and what doesn’t. Protocol stuff is raising the most money. That’s because it’s still early days and the big problems are about building out infrastructure. That’s why EOS (parallel processing and scalability around transaction speed) raised so much so quickly and put them in the #1 spot. The next big area is platforms. The ole startup platform play. Today, if you’re not a platform, yer nuthin’. So, we’re going to see platforms for everything start to play out. And then, a platform for platforms. Oy. It’s going to get messy. The last area we’re seeing is the emergence of consumer-based coins. Something directly related to everyday people. It’s very small, and emerging, but as we know from the rest of the tech industry, the consumer side always creates the most value. It’s not the OLED display maker who is gaining all the profits, but rather Apple with the fully integrated iPhone. I have an idea for one in the consumer space that I think makes a whole ton of sense that we’ve seen play out time and time again. It all comes back to human emotion. In this case, ego. But we’ll wait and see if someone comes up with the idea, the right approach, and executes on it. Here’s my ICO List Excel File should you want to continue the analysis.